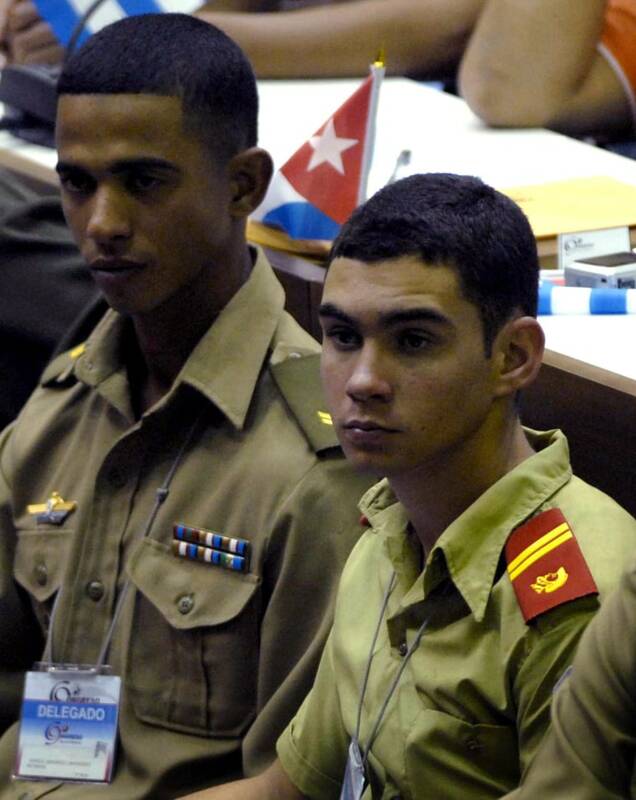 A decade after the international custody fight over the young castaway, Elian Gonzalez is now a 16-year-old living in Cuba. Fifteen years ago, the country’s attention was focused on the fate of a 6-year-old boy. Before dawn on April 22, 2000, armed federal agents burst into a house in Miami and seized Elian Gonzalez, a Cuban child at the center of a custody fight that became a national obsession. A fisherman had found him clinging to an inner tube off Florida in November 1999 after his mother and others drowned trying to reach the United States. He was taken to live with his relatives in Miami, but his father, still in Cuba, demanded his return. Fidel Castro led marches calling for the boy to be sent back to Cuba. The Miami relatives refused to let him go. The American courts ultimately sided with Elian’s father, and the boy was returned to Cuba in June 2000, two months after the raid. Above: Cubans holding signs of Elian Gonzalez protest in Havana in December 1999. Some 20,000 protesters turned out to demand his return. 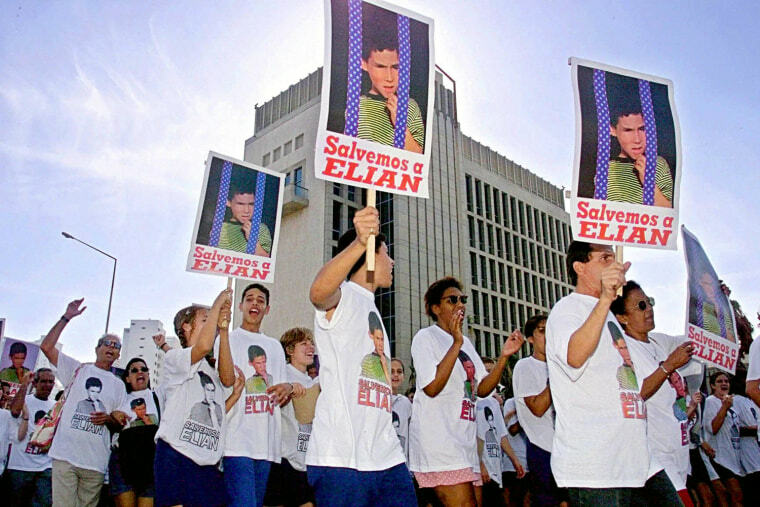 Elian's American relatives take him on a tour of the Lincoln Marti school in Miami in December 1999, where they picked up an application form for him. Elian plays while journalists swarm him in front of his great-uncle's residence in January 2000 in Miami's Little Havana. Elian Gonzalez, center, walks to school in Miami's Little Havana, Fla., in February 2000 with his great uncle, Lazar Gonzalez (left), and cousin, Marysleisis Gonzalez. The custody battle over him was between his biological father, who lived in Cuba, and his Miami relatives, who wanted the boy to remain in the United States. Donato Dalrymple, one of the fishermen who found Elian floating in an inner tube off the coast of Florida, plays with him in his relatives' backyard in Little Havana in April 2000. 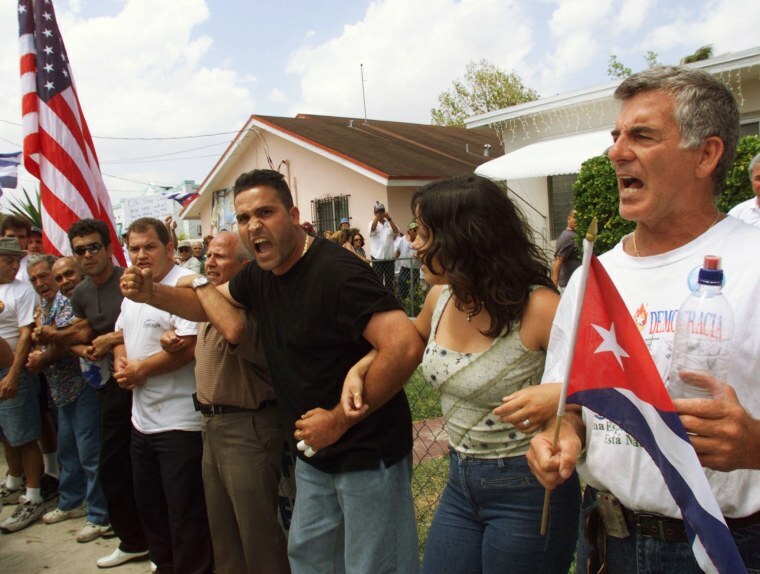 Protesters link arms in front of the Florida home of Cuban refugee 6-year-old Elian Gonzalez after they broke down a barricade seperating them from the house on April 4, 2000. A rumor circulated through the crowd that the Immigration and Naturalization Service was coming to pick up Elian, spurring protesters to form a human chain around the house. Elian is held in a closet on April 22, 2000 by Donato Dalrymple, one of the two fishermen who rescued him, as government officials enter his uncle's Miami home. Armed federal agents then seized Elian, firing tear gas into an angry crowd as they left the scene with the weeping 6-year-old boy. Elian Gonzalez looks out the window of a mobile lounge prior to his departing from Washington Dulles International Airport on June 28, 2000. The Supreme Court refused to hear an appeal from Elian's Miami relatives, who had fought to keep the 6-year-old in the United States. 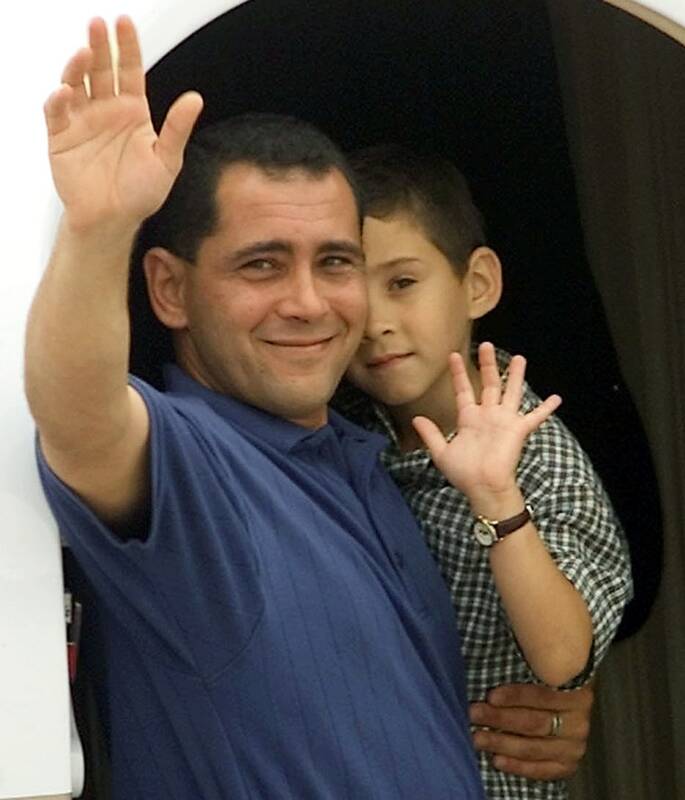 Elian Gonzalez and his father Juan Miguel Gonzalez wave goodbye as they board a chartered jet for their return to Cuba at Washington Dulles International Airport, June 28, 2000. 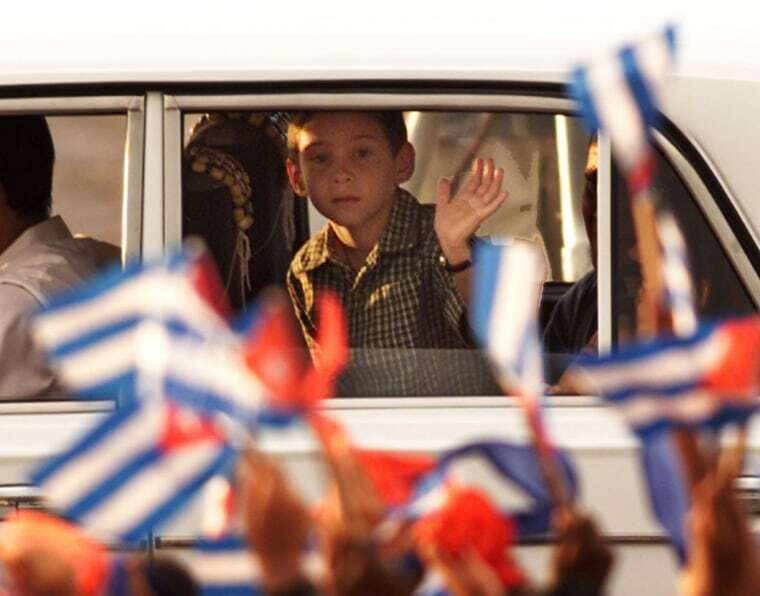 Elian waves to his fellow school mates on his arrival to Havana, Cuba, on June 28, 2000. 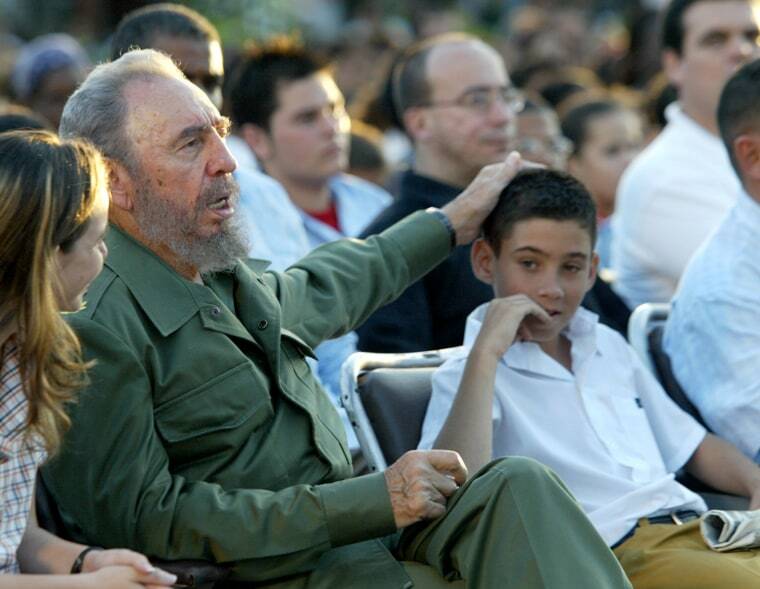 Elian, wearing his school uniform, sits next to Cuba's then-President Fidel Castro in December 2005 in Cardenas, Cuba, at a political event commemorating the island's successful campaign to gain custody of the boy from the United States. 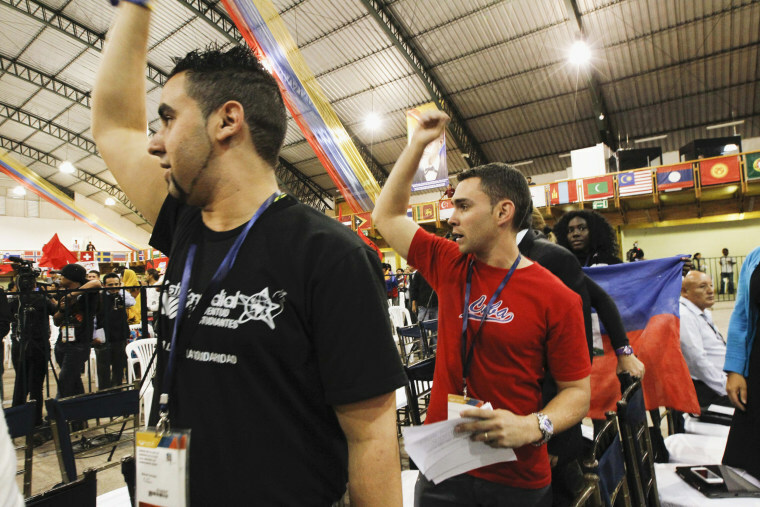 Elian, right, takes part in the IX Congress of the Communist Youth Union in Havana, Cuba on April 4, 2010. He is a cadet at the Camilo Cienfuegos military school. 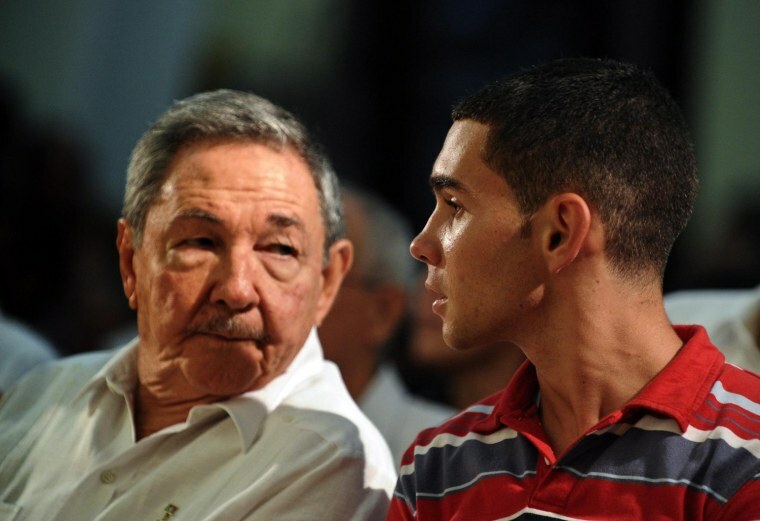 Cuban President Raul Castro and Elian Gonzalez attend a religious ceremony at Cathedral Episcopal de la Santisima Trinidad in Havana, Cuba, on June 30, 2010. The ceremony commemorated the 10th anniversary of his return to Cuba from the U.S. after he was found floating on a raft in the waters off of Florida on Thanksgiving Day, 1999. 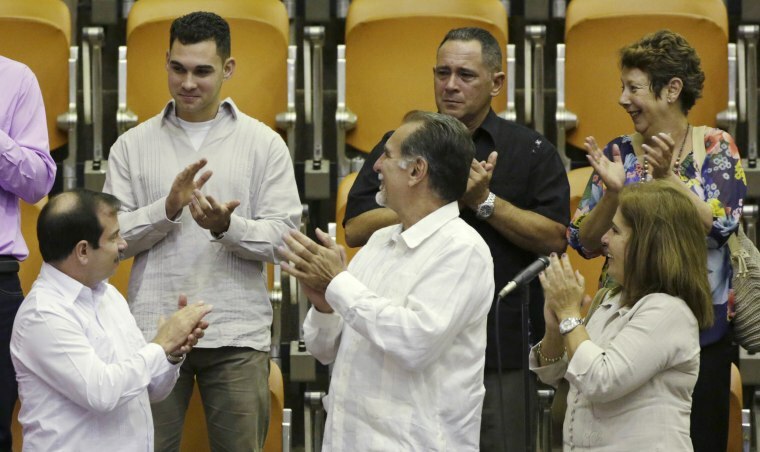 He was the sole survivor of a boat that capsized, killling his mother, stepfather, and nine other people bound for the U.S.
Elian (top left) stands with two of the so-called "Cuban Five" Fernando Gonzalez (bottom left) and Rene Gonzalez (bottom center) while attending the Cuban National Assembly in Havana on Dec. 20, 2014. President Barack Obama this week reset Washington's Cold War-era policy on Cuba and the two countries swapped prisoners in a historic deal after 18 months of secret talks.